Why do I paint the country? I have been blessed to live and paint on a quite old farmstead, surrounded by fields, for most of my life now. It all started when I was a kid growing up. We lived at the edge of town and I remember the walks through the field of corn behind our house, and the feel of the damp earth on my bare feet back then. The trips to my grandparent’s remote Midwestern farm, are some of my favorite childhood memories, and from as far back as I can remember, I always wanted to live in the country like them! My husband grew up on a farm, and soon after we married we moved to the country. 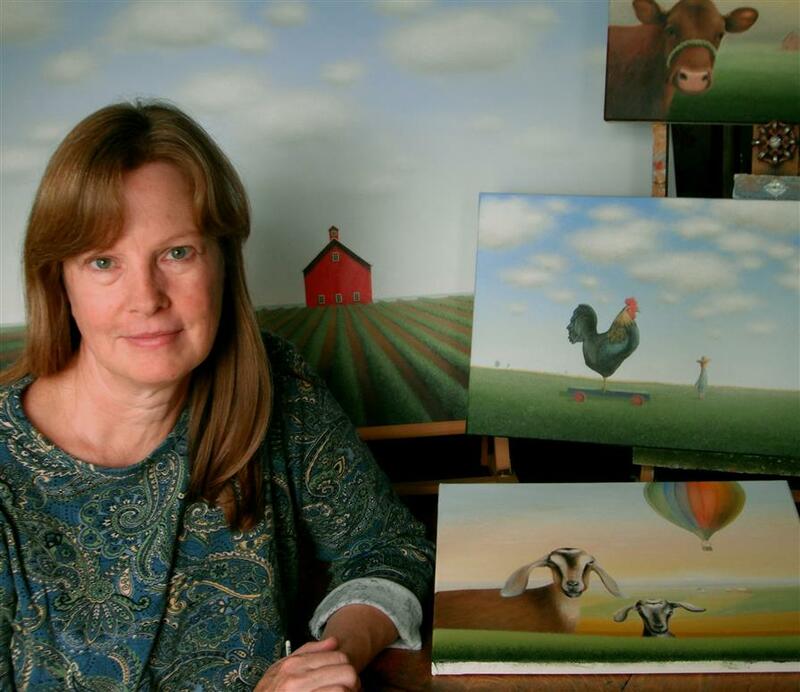 We live on an old farmstead with a farmhouse and a red barn, which are a great inspiration for what I paint. It gives me a sense of peace and happiness to work on my quiet, country, landscape paintings, and I hope that you may find that in them also. The ideas for my paintings come from my imagination, and are often of memories, and places that I have been and seen, here in the Midwestern Heartland. I paint my landscapes simply, from my heart. In my paintings I want to capture the feel of peaceful, quiet, isolation, found in the country. I have always had a fascination with old farmsteads, especially the old farmhouses and barns found on them. Some of my fondest childhood memories and inspiration are of the visits to my grandparent's remote Midwestern farm. Set down a very long lane, that eventually wound around the old barn, horse pasture, granary, and corncrib, machine shed, chicken house, to end up at their old farmhouse with a white picket fence in the yard beyond. The croquet set would be on the lawn and Grandma would have one of her homemade pies waiting on the kitchen counter. A little bit of heaven here on earth; it felt to me back then! Two of my paintings were chosen to be hanging in the THIS OLD HOUSE Magazine Show house, "Cloudland Cottage" for the fall of 2015 at Lookout Mountain, Georgia. They can be found in the article about the house, and artist’s work hanging there, in the Nov.- Dec. 2015 magazine. 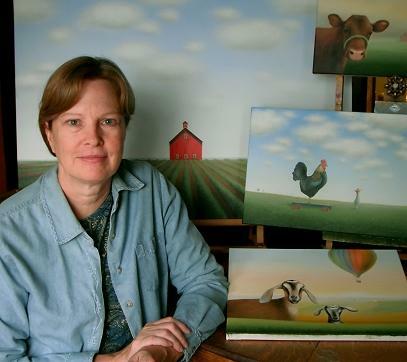 I received a Bachelors of Fine Arts Degree from Northern IL University and am a juried member of the Society of Animal Artists. My paintings have been exhibited in national and regional art exhibitions though out the U.S.
My original landscape paintings are in the collection of Kishwaukee College, Malta, IL, and in private collections throughout the U.S., and in: Canada, France, Iceland, Portugal, Belgium, England, Ireland, Scotland, Italy, Japan, Brazil, Zimbabwe, and Australia. My painting style leans towards Realism, although I often use elements of Tonalism and Minimalism in them. I have been inspired by the Tonalists, Hudson River School Artists, Minimalists, and Realist artists for my art. I work in acrylic, oil and soft pastel, although I most often work in acrylic on stretched canvas, for my Heartland landscapes. I build up many layers, using both wet and dry brush techniques, for my paintings. My artwork has been described as having an intriguing peacefulness, in its quiet simplicity. Thank you for your interest in my original art!